The Penguins saw Thursday’s game against the Kings as a test for them. And they passed. Pittsburgh skated to a 4-1 win over Los Angeles at the Staples Center while producing the kind of game they wanted, and needed, to play after an inconsistent stretch. The Penguins were buoyed by their terrific start, beginning when Evgeni Malkin opened the scoring just 57 seconds into the game. And though the Kings tied it shortly after, Pittsburgh’s power play responded by converting twice with goals from Chris Kunitz and Jussi Jokinen to give the Pens a 3-1 lead after 20 that Tanner Glass would add onto in the second. Having an early advantage like that over the Kings, who had the NHL's No. 1 defense going into the game but a slumping offense that was already one of the league's least productive, was crucial. 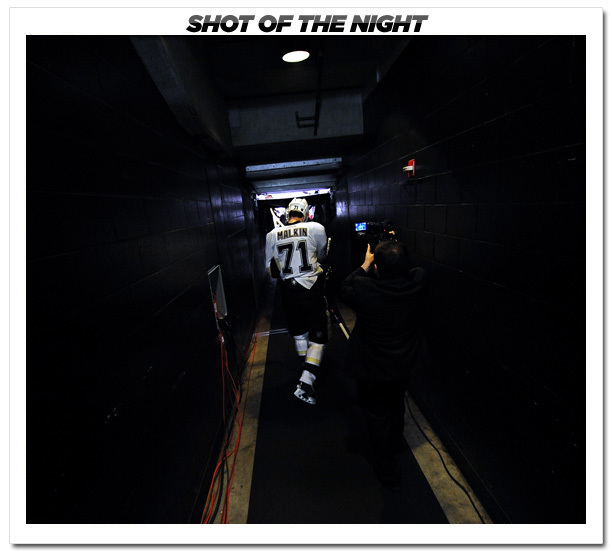 That being said, perhaps the biggest takeaway from Thursday is how complete of a game the Pens played. They didn’t try to force anything. They stayed focused on their structure and played physical, simple and patient within it – making the smart, responsible plays and managing the puck well as they waited and worked for opportunities to open up. And when they did, the skilled and talented Penguins took advantage. While the Pens stuck to their structure, the Kings seemed to abandon theirs. Pittsburgh made the big, bruising Kings – known for their heavy, defense-first, playoff-style brand of hockey, which won them the Stanley Cup two years ago – look lost, overwhelmed and flatfooted, and chased Jonathan Quick from the net after 20 minutes. Now, the Pens didn’t play a perfect game – they weren’t without their breakdowns. But whenever they happened, goaltender Jeff Zatkoff was there to make the needed saves. He had a few clutch stops on Mike Richards (pad save on a rebound chance), Anze Kopitar (stoned him while he was all alone in the slot) and Justin Williams (breakaway glove save). He tracked the puck like a hawk through traffic and also came up big on the PK. With his 22-save win tonight, Zatkoff is now 9-0-2 in his last 11 appearances. This one was extra meaningful for Zatkoff, who was drafted by Los Angeles in the third round (74th overall) of the 2006 NHL Draft. While he never played a game for the Kings during his time there, as he was stuck behind Quick and Jonathan Bernier on the depth chart, Zatkoff spent a decent amount of time in the organization. He played three-plus seasons with their American Hockey League affiliate, the Manchester Monarchs, from 2009-12. The friendly, personable and outgoing Zatkoff has become a favorite locker room personality and a beloved teammate in his first NHL season. And Pens coach Dan Bylsma could tell the guys really wanted to get this one for him. “I think the guys were fighting hard for 'Zats' there throughout the game and at the end just trying to get him the win,” he said. Malkin was absolutely flying this evening, and his speed paired with his stickhandling – honestly, sometimes it looks like the puck is glued to his stick – gave the Kings a tough time. And with the game tied at 1, Malkin proceeded to draw two penalties on the same play – a hooking call on Jarrett Stoll and a slashing call on Dustin Brown. That gave the Penguins a full two minutes on the two-man advantage. With Pittsburgh owning the NHL’s No. 1 power play, odds are that wasn’t going to end well for the Kings. And it turned out to be the worst-case scenario for them. With Kris Letang scratched for tonight’s game due to illness, Bylsma opted to go with five forwards over the boards to start. A risky move, but it was rewarded. Jokinen followed up his gorgeous feed on Malkin's first goal with another one to Chris Kunitz, who beat Quick for his 27th goal of the season – a new career high for the Pens winger. That negated one penalty, but the other remained. And after assisting on Pittsburgh’s first two goals, Jokinen decided it was time for one of his own. Malkin returned the favor from earlier and found him at the circle. He took a second to settle it down and then fired a wrister past Quick just 57 seconds after Kunitz did. Looks like Jussi Jokinen may have to fly his mother in from Finland to more games. With her in the stands watching as part of the first-ever Penguins Moms’ Trip, Jokinen got off to a scorching hot start in this game – assisting on Pittsburgh’s first two goals before scoring one of his own, all in the first 11:47 minutes of play. We always talk about James Neal’s chemistry with Malkin, and rightfully so. But we can’t disregard the way Jokinen meshes with his fellow European Malkin, either. Playing alongside him on the wing has allowed Jokinen’s vision, hockey sense, skill and creativity to flourish both there and on the power play. He's also shooting the puck more because of the fantastic set-ups he's been getting from Malkin (and is producing pretty playmaking of his own). Overall, Jokinen’s confidence in all situations looks to be the highest it’s been in some time. It’s translating to the scoresheet, as he now has 16 points in his last 14 games (7G-9A). Winger Glass beat goalie Martin Jones, who replaced Quick to start the second, with a filthy backhand that had to make Sidney Crosby proud. Glass – in his second season with Pittsburgh – has been playing his best hockey as a Penguin over the last few games. Just look at what he’s done his last three games: threw a franchise-record 13 hits at Dallas on Jan. 25, recorded his first multiple-point effort as a Pen (1G-1A) vs. Buffalo Jan. 27, and followed that up with a goal tonight in Los Angeles. Defenseman Kris Letang missed Thursday’s game due to illness. Defenseman Robert Bortuzzo entered the lineup in his stead next to former King Rob Scuderi and played a heavy, physical game, throwing crushing hits left and right and making his presence felt from the drop of the puck. He was credited with a team-high six in the game. Fun fact: Bortuzzo made his NHL debut on Nov. 5, 2011 in this arena against this team.